A graduate of the University of Lagos where she obtained a B.Sc Ed. (chemistry) and a Masters in Educational Administration and Planning. An Associate Member and active Patron of the Nigerian Red Cross Society Lagos State Branch. Upon completion of her first degree she managed family business with her father and later worked as an Assistant teacher for some years before leaving to pursue her masters degree. During the course of her undergraduate days it was and still is a pre-requisite to undergo teaching practice as a student of the Faculty of Education and prospective teacher. Akhere noticed there were intelligent students with prospects who needed extra moral and financial support. Her late mother supported her to support the students. That was the official beginning to Akhere’s philantropic life. Not too long , Her mother passed on, it didn’t deter Her as She went ahead to sponsor two out of these students who are today graduates of Engineering and Computer Science to the glory of God. 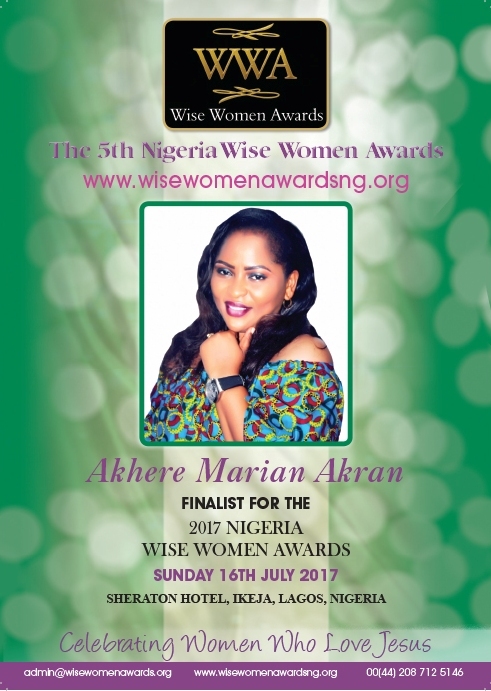 Akhere founded and registered the Agatha Obiageli Aghedo Memorial Foundation in 2011 with a mission to alleviate the suffering of the less privileged in local communities. The foundation has organized (and still organising) numerous outreaches in different less privileged communities where relief items are redistributed every quarter. As a health advocate she has also realised that health information and availability of funds is a major challenge for the less privileged so she has partnered with organisations to take information to communities in Ajegunle and Satellite town. She has organised two major breast cancer awareness campaign in partnership with Sebeccly cancer care, stroke and hypertension in partnership with Ifean health , free genotype testing in partnership with Sickle Cell Aid Foundation Nigeria. Akhere advocates for persons with various forms of impairments and started a #NoChildShouldBeLeftBehind capmaign, where she emphasises the inclusions of these special angels into the society. This led to the St.Agatha’s Special Needs Centre charity project in Satellite town where children with special needs come daily for therapy and support group meetings for parents of these angels. This project reiterates her belief that Disability is not Inability and therefore people should show love, empathy and not pity. In the last one year she has organised four awareness walks in Satellite town as she believes “charity begins at home” but doesn’t stop there. This is also targetted at less privileged families in Satellite town who can’t afford the cost of inclusive education. The centre is entirely free. Akhere has kicked off an Educational project at the Destitute Home in Ebutte Meta where she educates the children for free. She believes every child has a right to Education. On the foundations visit to the home where they distributed relief items they saw children and not destitutes. This is also a #NoChildShouldBeLeftBehind project. With education the segregation, stereotype and isolation of these children from the society is greatly reduced. Akhere is happily married to Prince Adesoji Akran and they are blessed with two Adorable children who are also actively involved in the work of the foundation. Akhere believes that getting them involved is also ensuring the next generation is not left behind. Akhere has an identical twin sister Mrs Odion Chigbufue who is a tour consultant.